The GLCyberBooth solution enables service providers to use voice over IP (VoIP) technology to deploy long distance telephony services easily and cost efficiently in various locations such as in-store phone booths, call shops or internet cafes. It combines all the benefits of a traditional phone booth service with the affordability and portability of VoIP technology. Because all communications are executed with VoIP, telephone calls can be placed from any GLCyberBooth. The phone booth can be installed anywhere in the world that provides internet connection. 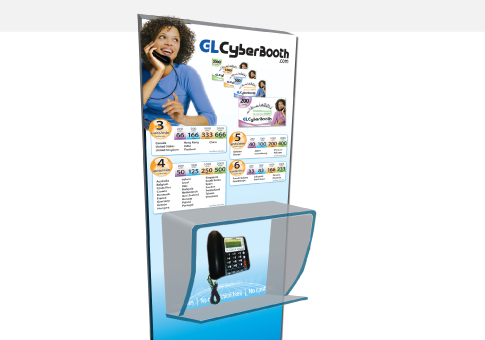 Customers would purchase GLCyberBooth cards with various credit amounts defined in units (200, 500, 1000 & 2000 units) and use the CyberBooth phones in various locations to make long distance calls. Users would simply need to pick up the phone, enter the PIN printed on the back of the card and place calls worldwide at our competitive rates - no access number entry is required. GLCyberBooth is a Pay-as-you-talk VoIP service. You can enjoy all the features and benefits of VoIP as well as budget your phone expenses, all while avoiding extra fees. You will never have to dial a long access number again. GLCyberBooth services are available worldwide and give consumers the ability to take control of their phone usage. It is an easy, flexible and cost effective way to call locally or internationally at low costs. GLCyberBooth calling cards are available in various denominations and can be purchased and used without any sort of account facility. Each card is assigned a fixed amount of credit and is to be discarded after use.